The Lucid jewellery collection embodies elegance, style and sophistication. Expertly designed and crafted entirely by hand, these incredible pieces are simultaneously clean and ornate, contemporary and timeless. 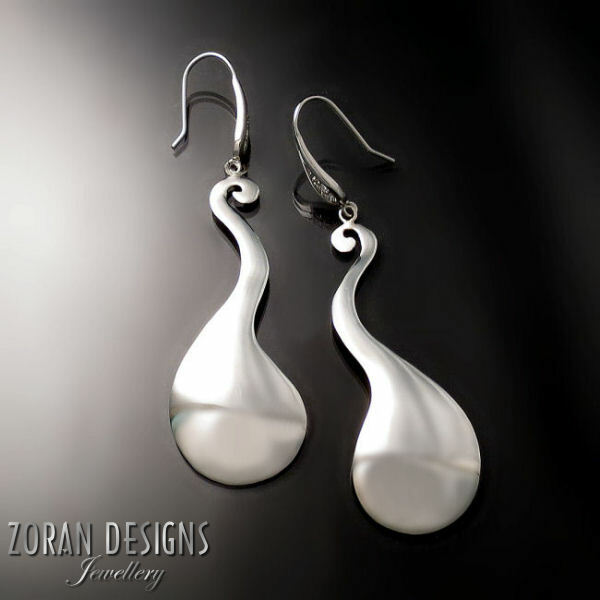 Fluid shapes and feminine curves make each piece striking yet soft. Dreamy designs with a bright clarity that awakens the senses. This is LUCID. It all starts with hand drawn sketches. A hand saw is used to cut each segment of the design. Each segment is hammered into shape to achieve a beautiful contour. Every piece is hand filed to soften the edges and ensure a perfectly smooth surface free of any hammer marks. Segments are aligned into their intended design and soldered together. Things get pretty hot! When making jewellery that is to have a shiny finish, polishing involves several steps. Starting with rough grit then working your way to super fine until the piece is perfectly finished and free from all scratches and imperfections. Rubber bits are sometimes used in areas where the buffing wheel may not be able to reach well. The final step is to use a buffing wheel to achieve that perfect, mirror like shine. Beautiful silver statement necklace. Unique, modern design from the LUCID jewelry collection. Beautiful earrings from the LUCID jewelry collection.